The Cheetah 313-PPLA label applicator is an original design, not an imitation, by Cheetah Systems engineers, using the latest electronic technology available, combined with rugged industrial grade materials; powder coated aluminum and Stainless Steel. Although this may sound expensive, the price is surprisingly affordable. Simplicity is the key. However, durability, flexibility, and speed are also key features of these Label Applicators. Die cut pressure sensitive labels can be applied at 500 linear inches per minute. 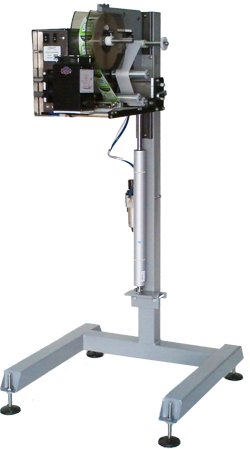 The Cheetah 313-PPLA series label applicators can be mounted directly to a conveyor, on a Cheetah mobile stand with electric up / down adjustment, or even on a table top to be used as a semi-automatic applicator for smaller volume applications. Label roll changes are a snap with the Cheetah spring loaded label reel holder and the single lever label liner release feature. Label rolls can be changed in seconds. The Cheetah 313-PPLA Label Applicators are simple to operate, durable, & affordable.